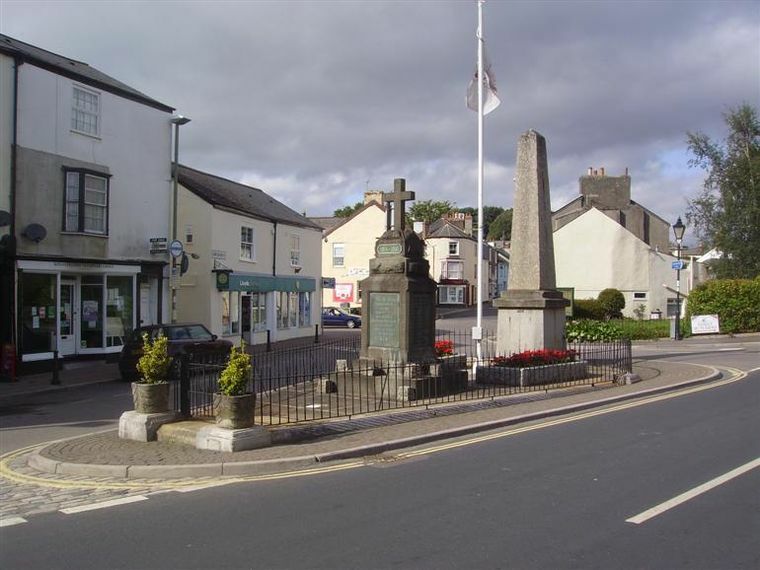 In 1919 a memorial to remember the sixty-one men of Chudleigh who perished in the first war was considered but matters moved slowly and it was not until late 1925 that matters took a more positive turn. In January 1926 a meeting was held to discuss the location of a war memorial; three sites were then under consideration: Kate Brook Hill, the Cemetery entrance and within what was previously the Diamond Jubilee memorial triangle of 1897 in Conduit Square. The triangle was seen to be the least favourable spot and an item in the Weekly Expressof January 1926 revealed why: '....inasmuch as it was the meeting-place of all classes, and also the stopping-place of the motor buses'. It was also mentioned that 'it was formerly a memorial, but had been allowed to become a dumping-ground for dead cats and rats, tins and other rubbish, and at present was used very much as a playground for children'. Some two months later and following further deliberations it was agreed to use the location at the triangle which would be an opportunity to once again smarten-up the most central point of the town. In proud and grateful remembrance of the men from Chudleigh who gallantly sacrificed their lives in the course of liberty and honour in the Great War, R.I.P. Above this are the numerals 1914–1918. Two side tablets contain the names of the fallen in relief and on the back tablet (north side) was a laurel wreath in relief. The cross and base were made by the Teign Valley Granite Company and the tablets supplied by J. Wippell and Co. of Exeter. Once again, as with the previous jubilee fountain the whole enclosure was to be encircled by railings but these had been delayed in transit due to 'labour troubles' and were installed some time following the official unveiling. The whole memorial, paid for by public subscription, finally cost £165. 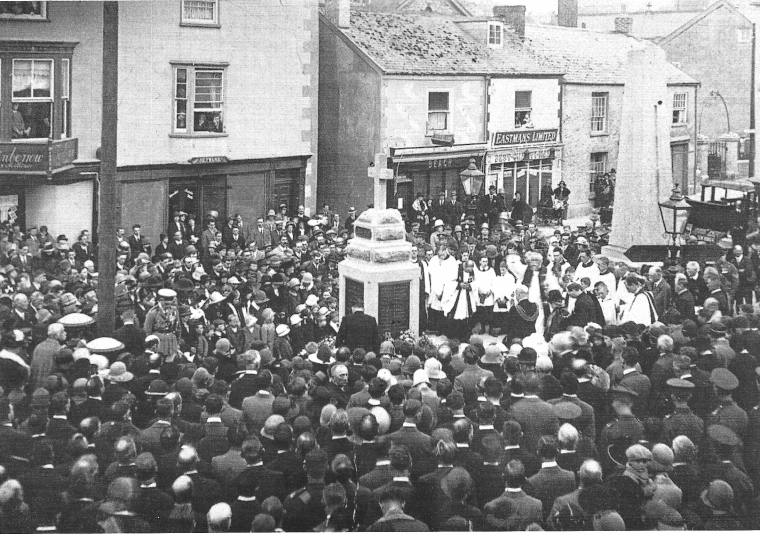 The dedication service and unveiling took place on 9 May 1926 at 3.30pm and was said to have been attended by upwards of two thousand Chudleigh residents and a great number of visitors. In the main, the town was generally pleased with the overall result but conceded that the siting was not ideal, owing to its proximity to 'the huge granite obelisk'which overshadowed it and the closeness to the electric pole which had previously been erected at the southern point of the enclosure. 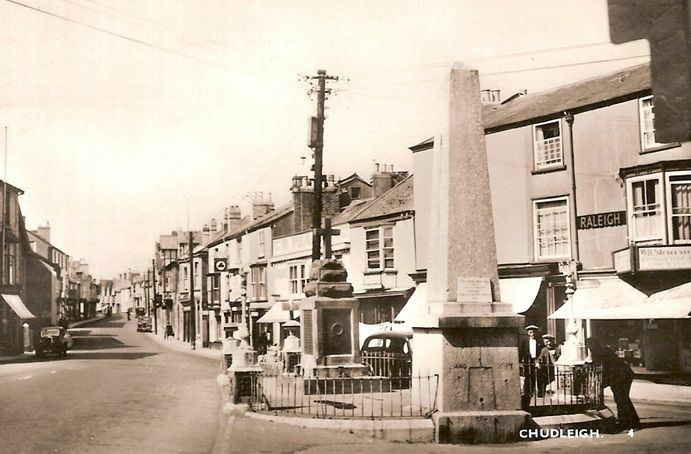 In November 1946 at the parish meeting, discussions were held as to how best to honour the fallen of Chudleigh in the recent war. Ideas put forward were the placing of seats around the town inscribed with their names, a public baths or a new fire engine; the baths idea would cost at least £2,000 and the fire engine idea was also not proceeded with on cost grounds. In March 1947 the idea was to create a new tablet on the north side of the existing town centre memorial, the cost was considered to be £200. The War Memorial in early 1948. On 9 May 1948 the new tablet on the north side of the memorial was unveiled. The previous tablet with the wreath motif having been removed. This new tablet recorded the names of the twenty-two men from Chudleigh who had lost their lives in the second war. At the dedication ceremony the newspaper reported that 500 persons were present and that the event was accompanied by 'brilliant weather'. Affixed above the new tablet on the north side was a smaller tablet which carried the following inscription: The seats placed around the parish are to the memory of the men of Chudleigh who gave their lives in the 1939–1945 war. The £200 required had been raised by subscription and was allocated as £100 for the adding of the names, £90 for the seats around the parish and £10 towards the memorial within Exeter Cathedral. By April 1949 a total of twenty seats had been placed around the parish. With the anniversary of the commencement of The Great War in 2014, the History Group has been looking at the backgrounds of those named on the memorial. The following lists are direct transcripts of names from the memorial in The Square and to those we have added that person's forenames with their years of birth and death. If you have an ancestor listed below we would be pleased for you to get in touch with us via the 'Contact' page as we may have additional information. For those wishing to learn more of the men named on this memorial Roger Perkins' book The War Dead of Chudleigh(2002) is highly recommended. The book is now out of print but the History Group has a small number of copies available for sale. In the book, Roger identifies a further nineteen Great War casualties who could have been included on the Chudleigh memorials but for one reason or another were not. A recent view showing both the war memorial and the obelisk. In 1919 the first of the Chudleigh Rolls of Honour was unveiled. Located in the parish church it is an ornately carved wooden plaque, situated high on the wall close to the pulpit. Its unveiling and memorial service to the fallen took place in November 1919. A companion memorial board for those fallen during WWII can also be found nearby in the north chancel. The WWII Memorial in the church. AJ Prowse's name was added, by family request, in 2015. There is also a third Roll of Honour. In May 1956 a memorial to those of the Congegational Church that had fallen in both wars was unveiled in the chapel during a commemorative service by Major-General GT Cowan. Rev FE Moore conducted the service. The panel was made by Mr Jack Caunter. The memorial was taken down when the chapel closed and was stored at the Town Hall until March 2010 when it was affixed in the main entrance hall. It names fifty-two WWI casualties and twenty-two from WWII. Note that the war memorial erected in The Square in 1926 contains sixty-one names for WW1. In early 2014 new research was carried out into the names of the WWI Chudleigh fallen. 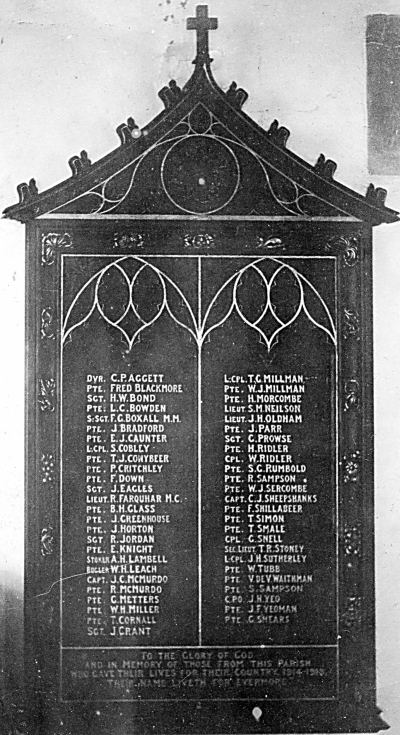 This research led to the finding of a further 23 names of men connected with Chudleigh that had been omitted from the earlier memorials. The History Group then commissioned a new Roll of Honour for permanent display in the Town Hall. 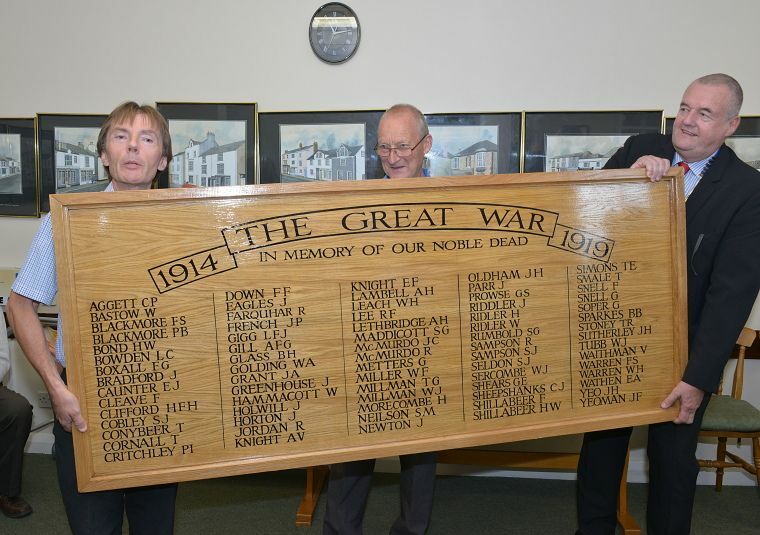 On 15 August 2014 at a small gathering in the Town Hall history group chairman Alan Brunton along with Stephen Coombes – the principal researcher – formally handed over the memorial board to Cllr Chris Webb. At the present time, these 75 names are considered to be the definitive list of Chudleigh WWI casualties.